Stoke City's Glenn Whelan says their performance in the 4-1 FA Cup fifth-round exit at Blackburn was the worst he has seen in seven years at the club. Mark Hughes' side have conceded eight goals in their last two matches. "To the fans I apologise, because that's not the Stoke City that I know," said the 31-year-old midfielder. "The players didn't want to be out there. You could see that after the first 10 minutes. That's the worst I've ever seen," he told BBC Radio Stoke. "We're not prepared to work hard enough," he added. "We've got good players, but maybe we haven't got enough in the dressing room and hopefully the manager has seen that." Glenn Whelan has now made 252 Stoke City appearances since signing from Sheffield Wednesday for £500,000 on January transfer deadline day in 2008. The Dublin-born ex-Manchester City trainee, who has also had two spells on loan at Bury, has won 61 caps for the Republic of Ireland. Following Wednesday night's 4-1 home defeat by Manchester City, Peter Crouch fired Stoke into the lead at Ewood Park before it started to go wrong in the final 10 minutes of the first half. Josh King equalised then went down in the penalty area, resulting in a straight red card for Geoff Cameron and a penalty that Rudy Gestede converted. Norway-born former Manchester United trainee King then twice outpaced the Stoke defence within five minutes to earn Blackburn their place in Monday night's quarter-final draw. 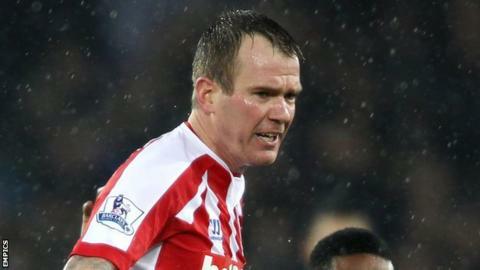 "Fair play to Blackburn," said Potters vice-captain Whelan, who picked up his fifth yellow card of the season. "They thoroughly deserved to win. "We've sat down and we've had words between ourselves but what was said will stay in the dressing room. It's not nice coming away, especially after a defeat midweek to the champions." Stoke's next game is against Aston Villa, who did make it through to the Cup quarter-finals and are now under new management following Saturday's appointment of Tim Sherwood.